Final amp board with old finals removed, and ready for board modifications. 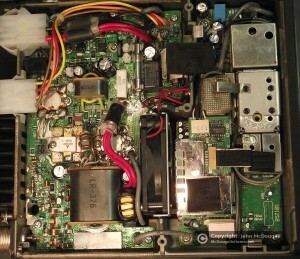 IC-706MKIIG amplifier board with new final transistors mounted in modified circuit board. A few YEARS ago, I noticed that my Icom IC-706MKIIG Amateur Radio Transceiver was very hot. The problem was, it was NOT turned on! I immediately unplugged it from its 12V powers supply, and pondered it for a long time. Apparently, the final amplifier transistors in the IC-706MKIIG are not wired through the power switch, but they get their power directly from the 12VDC line coming into the radio. If all is working well, and there is no drive to the transistors, there is no current drawn. One of mine, was drawing current, and a lot of it, all the time. Ten Amps of current, all the time. My radio sat for a few years, with me occasionally looking at it and wondering what to do. Finally, in late 2012 or early 2013, I contacted a repairman about my radio. The ball was moving to my court, because #1: the repairman was too busy to take additional jobs, and #2: the repairman informed me that my radio was of an “old” design. It had SRF-J7044 Mosfet transistors for the HF finals. They were no longer being made, and they are extremely rare to find. An alternative was to “replace” the final amplifier board at the cost of over $400. No thank you! I did a lot of searching around and found Jose Gavila’s (EB5AGV) web site. He replaced the transistors in one of these older Icom radios with newer transistors, and he documented it very thoroughly. Being a hardware kind of a guy, I decided I could do the repair following his steps. And here are the results. I videoed the process for your viewing pleasure. 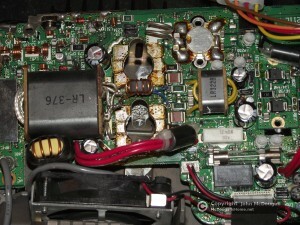 If you have an older IC-706MKIIG with the same problem, you CAN repair it. 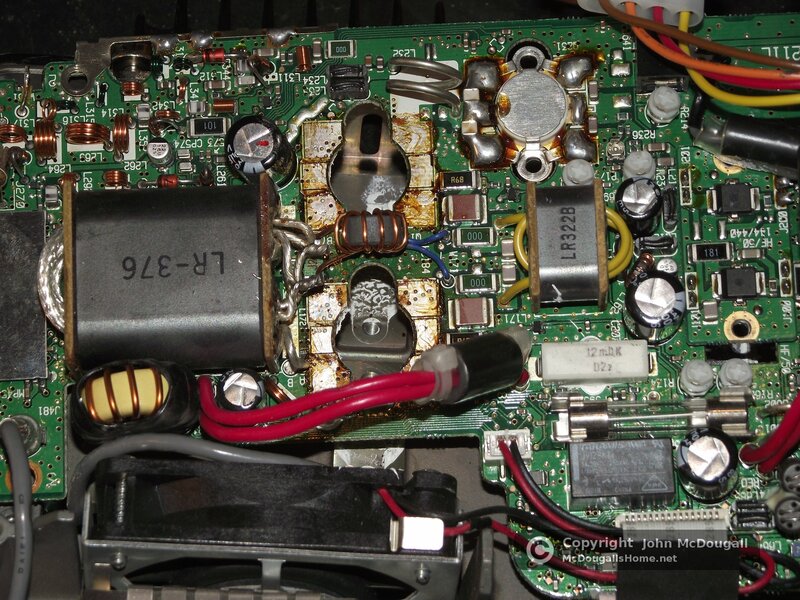 As a side note about the Icom IC-706MKIIG: Apparently, damage can be done to the final transistors while the rig is off when the installation is in a vehicle. I did have mine in a vehicle at one time. Constant starts of the vehicle, and heavy loads and fluctuations at the battery, enter the radio, and are applied to the finals because of the previously mentioned problem with them not being switched. If my radio again ends up in my vehicle, I will have it switched, so I can make sure no power is applied to it while I start or stop the engine. Thank you a thousand times for the nice details that Jose, EB5AGV provided in doing this mod.